Sir Harry Secombe , proposing Bob for Lord’s Taverners membership after working with him at a lunch. From a young age Bob was always interested in comedy shows and comedians. Little did he think he would one day get to know and work with many of his heroes from shows he heard as a child. Two were Charlie Chester and Ted Ray and he did get to meet and work in front of them before they passed away. Just a year after he was “discovered” Bob found himself sharing the bill at the Eve of Cup Final Banquet with Billy Connolly with Jimmy Tarbuck as the compere. Since then there aren’t many comics he has not shared the bill with. Russ Abbott, Max Boyce, Frank Carson, Jasper Carrot, Ronnie Corbett, Leslie Crowther, Barry Cryer, Jim Davidson, Ken Dodd, Bruce Forsyth, Rhod Gilbert, Frankie Howerd, Roy Hudd, Barry Humphries (as both Dame Edna Everage and Sir Les Patterson), Eddie Large, Bernard Manning, Eric Morecambe, Willie Rushton and many more. 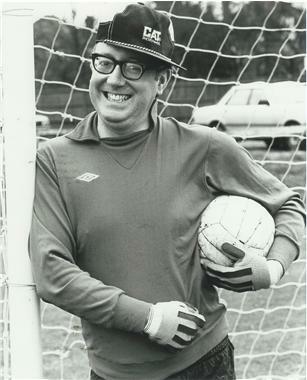 Bob at the old Wilsonians Fc. Picture courtesy of The People. Thank you so much for your great cabaret at the Peter Allis Golf Day – and for following Bruce Forsyth!